Basin in Nova Scotia. I have not had time to paint today. the distance. This is one vast space. The sound is the wind. to post on her blog. my painting life, family life, and my blog life. Labels: guest post Róisín O'Farrell's blog. paintings. Barbara Muir. Toronto. Canada. Friends are wonderful!! Who knew there would be friends in the blogging world? I watched your video three times and each time I noticed something I hadn't seen before. The beach, trees, rocks, water are beautiful. The vastness of the beach with no one there (except you) must have been a great experience. This is fun news! I loved reading your post and it is true about blogger friends. I'm so glad I can count you as one of mine! P.S. I'd love to paint that landscape some day! 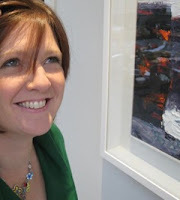 I loved your guest spot on Roisin's blog. I too was hesitant to start blogging but it really has enriched my life with tons of new friends, support and inspiration - like you. I am sure that that bright green ground I used on my overpass painting came from looking and admiring your bold colour choices. True. I know. It was an awesome experience. I hope you see it one day. You can paint that landscape any time you want to. I think I have photos too if you'd like them. What a sweet thing to say. I loved how that green set off the grey. Just awesome. I loved the mathiness of it -- like a sculpture -- which is how overpasses look when you are in a good mood. Thank you. I just love your latest Kingston painting.